Citrus Australia continues to foster its key relationships with Korea including an industry trade mission to the Seogwipo World Citrus Pre-Expo on beautiful Jeju Island in November 2013. More recently, Citrus Australia CEO Judith Damiani was also invited to participate in the Australian Prime Minister’s Business Delegation visit in April 2014. 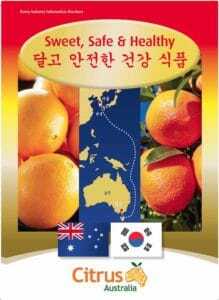 We are pleased to provide the following documents to interested Korean buyers of Australian citrus.